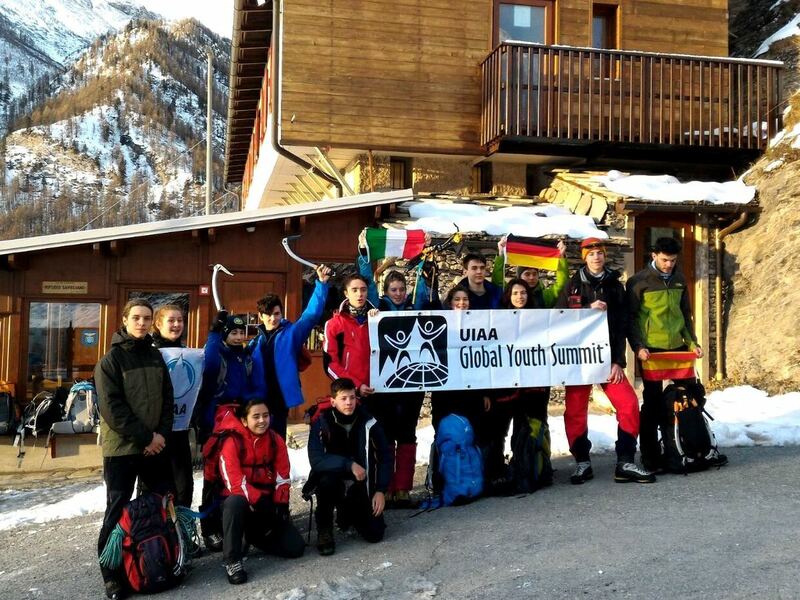 From 6 February to 10 February 2016 in Valle Varaita (Province of Cuneo – Italy) the ‘International Ice Climbing Camp’ took place, an event part of the UIAA Global Youth Summit. The project had the economic support of ARISF for ‘Developing Ice Climbing’. 14 participants took part in the event: 12 Italians and 2 foreigners (one from Spain and one from Germany). The base camp of the group was Savigliano Hut in Pontechianale. Below a short daily reportage of the event. Saturday 6 February: arrival day. We met all the participants at 16:00 at ‘Porta di Valle’ in Brossasco at the beginning of Valle Varaita. Here they were introduced to the final program of the event. The president of UIAA Ice Climbing Commission, Mr Urs Stoecker, joined to group and greeted the participants. With a brief presentation he explained what UIAA is and what are its goals. He showed some videos to introduce the group to the two faces of ice climbing: the activity on natural ice falls and the competitions on artificial walls. After the photos and greetings, the group left for Savigliano Hut where spent the evening learning about the technical equipment and setting it for the following days. Sunday 7 February: the participants were divided into two groups. The first group went to ‘Castello’ fall where started practicing the basis of ice climbing: crampons and ice axes use and progression. The second group with the more expert participants went climbing to ‘Anfiteatro’ . Unfortunately the weather was not nice and it snowed all day. At 12.30 we left for Turin where we visited the Cinema Museum inside the Mole Antonelliana. Monday 8 February: great weather. The participants were divided into three groups: the first climbed ‘Valeria’ fall above the village of Chianale, the second climbed ‘Berrò’ fall in the same area while the third group climbed ‘Pineta Nord’ fall in Pontechianale. Today was a very intense day and all the boys and girls were enthusiast. The late afternoon and evening were spent at the hut to let the participants socialize. Tuesday 9 February: the participants were divided into two groups who climbed ‘Berrò’ and ‘Pineta Nord’ falls. 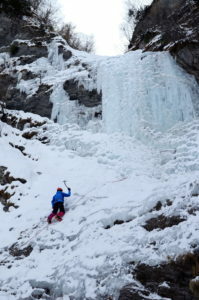 New routes were opened and the participants could also experience climbing on mixed surfaces because of the insufficient presence of ice in some areas. This day was full of activities and an exciting one for all the participants. In the evening took place the farewell party where all the participants were given the official event t-shirt, hat and UIAA pin. Wednesday 10 February: departure day. Considerations: This event was a great opportunity for all the participants to learn the basics of Ice Climbing: they were enthusiasts about this experience and asked to have the opportunity to repeat it in the future!